A twenty-foot-high shipping container, painted bright red on the side of Pilsen’s Lacuna Artists Lofts building, marks the main entrance to the offices of the creative agency Gertrude. 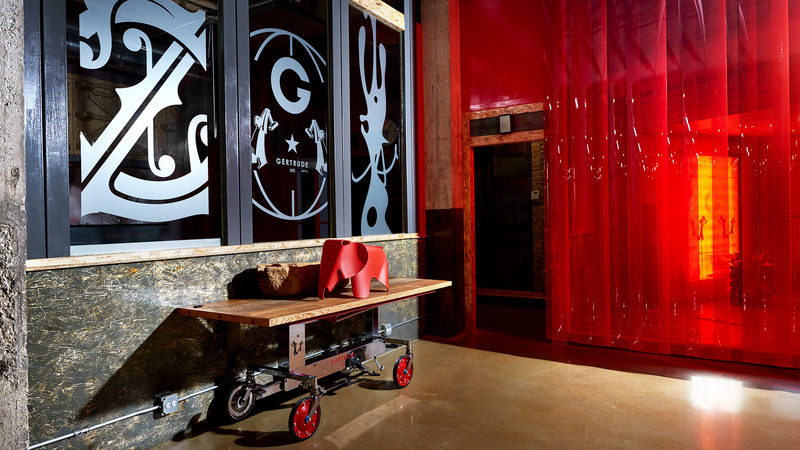 Step inside and you’re met with Gertrude’s industrial-meets-mid-century-modern aesthetic. Housed in the same space—and using that same vibrant color palette with a touch of distinct steampunk style—are the agency’s separate design and digital-branding division, OZ MFG. Co., and their newly launched experiential, branded architecture and environmental design component, RAYE. 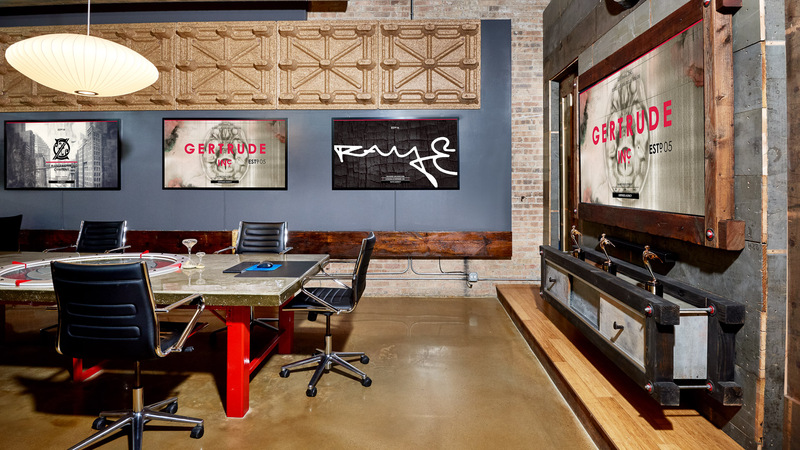 As an agency constantly evolving, Gertrude disrupts, invents and perhaps foremost, evolves. Its high-end clientele includes global companies such as Absolut Vodka, Adidas, Coca-Cola, Diageo, Disney and Google, to name a few. Whereas other agencies would have settled for such an esteemed roster, Gertrude is not your regular creative agency: founder and chief creative officer Otis D. Gibson and president Heather Knapp wouldn’t let it be. “There are lots of different agencies, and lots of agencies are doing the same thing,” Gibson says. “I started Gertrude in the West Loop twelve years ago. Then we moved to River North but we felt pretty much like fish out of water over there. It was a little too quiet in terms of creative inspiration,” he smiles. “We chose Pilsen because it has an amazing emerging edge and creatively, we wanted to be in a place where our employees can be inspired every day,” he says, explaining that they first discovered the company’s current home visiting a friend’s artist studio. With a background in fine arts, Knapp also understands the importance of using creative space, physical and otherwise. “When you walk in here, we’re walking into our portfolio. Every single piece has to do with how we transform a space into an idea: the materials, the lights, the details, it’s all about our philosophy, it’s what Gertrude feels like,” she says. “We’re a multidisciplinary shop focused on innovation,” she adds, explaining the importance of being open-minded to even the most outrageous creative ideas. At Gertrude this is kind of the norm. RAYE, their latest adventure, branches into new creative territory for the agency. RAYE envisions brand as place. What does this really mean? 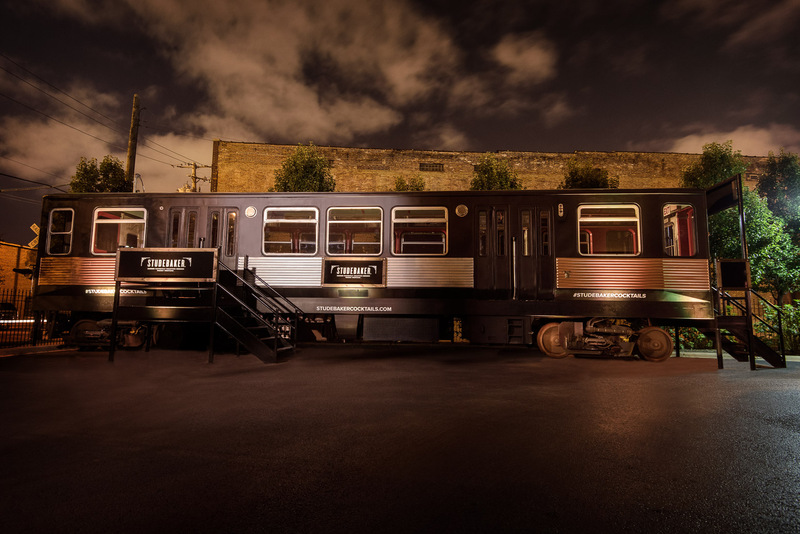 Think a retired 1967 CTA train car transformed into a 1920s-inspired club car, an original 1928 Ford Model A used to launch a 142-year-old bourbon brand and a repurposed shipping container turned speakeasy. “When we first moved here, there was this train sitting out in the parking lot. It was completely abandoned, all graffitied up and people would hang out in there at night,” Gibson says. “The thing was a mess but I knew we could make something really cool out of it. This was around the time we were working with Studebaker whiskey, coming up with the strategy and the marketing plan, and I couldn’t get this train out of my head.” Next thing he knows, he’s pitching his client on the idea of transforming the vacant train car into a reimagined 1920s whiskey club car for the launch of their Prohibition-inspired, ready-mixed cocktails. 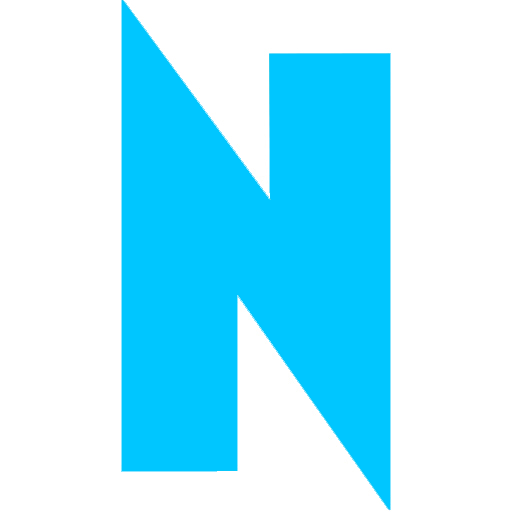 Now, with its three distinct divisions, Gertrude can accommodate the ideation and life of a brand at every step: Gertrude invents a brand, OZ will start shaping what that brand looks like, and RAYE brings it to life as an experience. “From concept to design to execution, these projects exist for a number of reasons,” Gibson says. “We happen to be in Pilsen, we happen to have enough room to do it and we happen to be in a creative environment that’s open to it. When all those things come together, I think it’s pretty unique.” Collaborating on a hands-on level with artists and craftsmen within the local community, Gibson is a firm believer in the city’s untapped talent. “All of our fabricators are within a three-minute drive/ten-minute walk. That’s really important to us,” he says. This past February marked all of the companies’ birthdays: Gertrude’s twelfth, OZ’s third and RAYE turned one. But they did not have a party. “We’re fortunately very busy,” says Gibson, “but maybe we’ll do it in spring.” Whatever they come up with one thing is for certain: it’s going to be quite an experience.